The garden has been planned as an urban oasis where residents can get their hands dirty or just reap the benefits. The project “is very much about the south Florida lifestyle, which is an indoor-outdoor lifestyle,” Greenfield says. And with a year-round growing season, there’s plenty of opportunity to reap the rewards of the food forest and garden. “The different seasons are going to have things happening,” she says. That means mangos in June, avocados in August, melons around September, and, over the winter, leafy greens and herbs. There are plans for fruit trees, including mango, star-fruit, and jackfruit, perennial vegetables like spinach, taro, and annual vegetables and herbs. Banana trees will be planted on the western edge of the property, according to the company. In addition, there will be edible hibiscus, papayas, and other plants. Chef Ed Boncich has also been working with the team to plan the garden, and will develop seasonal menus around the harvests, she adds. Interactive classes, children’s programming, and a gardening club are likely to be part of the offerings at the full-service residence, although the details are still being worked out. Lectures and workshops on how to care for certain species are also in the works, according to Greenfield. 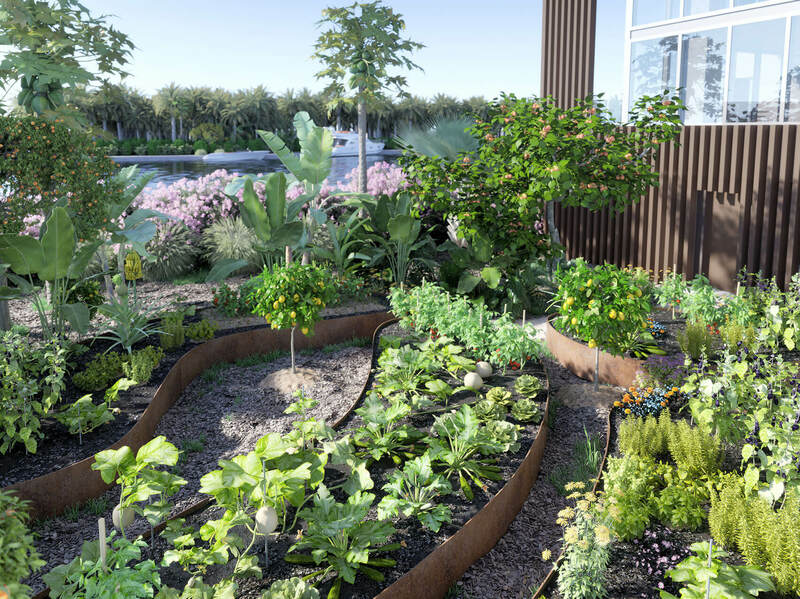 For residents who want more green opportunities, personalized edible gardens can be created by local company Foodscapes Capabilities on individual terraces and balconies throughout the building. These mini gardens range in price from $500 and to upward of $10,000, according to the company. The Ritz-Carlton Residences, Miami Beach, designed by Italian architect Piero Lissoni, will have 111 one- to six-bedroom condominiums and 15 standalone villas. Homes range in size from 2,000 square feet to more than 10,000 square feet, with prices from $2 million to over $40 million. It is scheduled to open later this year. Other amenities include a residential art studio, hotel-style service, a marine helipad, 36 private boat dockages, a rooftop pool deck with private cabanas, open air yoga studio, and a meditation garden. Read the article on Mansion Global and in Penta.